The minimal architecture is characterized by the presence of perpendicular planes that construct a three dimensional space, from a configuration volume of purified forms, considerably simpler and refined. This style can be easily identified by a "clean" construction and without excesses, by the use of neutral colors and modern industrial materials and the absence of unnecessary props... Born’s Halffloors® Halffloors® was built on a central city terrain with 80 square meters, were was built a house with useful 277 square meters, an architectural achievement using half-floors! The house has three bedrooms, one dining room, one living room, one office, three exterior accessfull areas (one a complement to a bedroom, other on the dinning/kitchen level and which is made of glass and other is the rooftop where exists a swimming pool) and a two car garage with car lift. The house is simple... it is organized in a vertical and hierarchical way. The social areas are on the inferior floors and the private areas on the superior levels. To achieve great visual amplitudes and dynamic interconnections between spaces, the interior was structured in half-floors. The width of the plot decided the stair. In fact, it became the heart of the house. Positioned adjacent to those spaces is a courtyard that together with the half-floor structure induces a vertical continuity, create a gentle horizontal connection. The courtyard affords a sense of depth and expansion to the spaces, allowing for all the floors from the basement to the first to be experienced as one space connected vertically and horizontally. It’s a minimalist house with a unique design! All interior decoration was specifically designed, from the wardrobes, dressers, kitchen (Warendorf kitchen|miele appliances), bedrooms, bathrooms (Cabinets, wash basins, shower trays and bathtub made in Corian®) and office furniture. The predominant colors in the house are white and black creating these a unity between the spaces making it very lightweight and "clean", with the exception of the couch, specifically designed for this house. Planned and designed taking into account environmental concerns, Halffloors® is a unfamiliar house with Class A + energy certification. 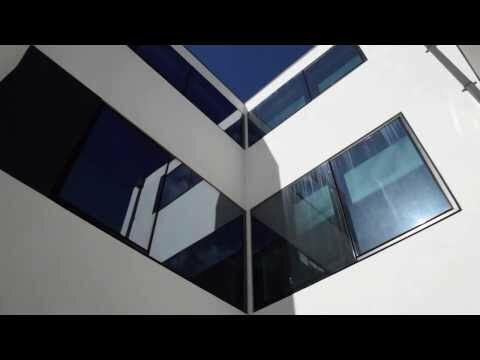 It was our objective to create a house as a unique object, so in order to do so exterior windows and doors had to align with the exterior house walls! Our idea was, “if in any way I could pass a hand over the front and back facade it should be only and element, without any recesses”. For that, we have to use a Structural Façade. With this façade the glass is glued to an aluminium frame using structural silicone. Also the entry door as the door garage had to be aligned with the exterior house walls. For that we have decided to pull back both doors and cover them with ALUCOBOND®. In the exterior it was decided to do a sidewalk on cobblestone. A cultural heritage, are used irregularly shaped stones, usually limestone and basalt. Traditional colors are black and white, enjoying the contrast of colors, shapes or decorative patterns with pictures, drawings or geometric patterns.